Turn Them! Flip Them! Draw On Them! 100 unique highly detailed dungeon geomorphs created by fantasy cartographer extraordinaire Christopher West and can be arranged in virtually any pattern you like. 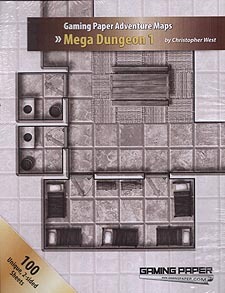 Two sided design with one side showing unfurnished dungeon rooms that you can fill with details for your home-brewed adventures, while the other side shows the same rooms furnished as imagined and rendered by Christopher West himself. Permission to photocopy the tiles for personal use, so you can re-use the designs over and over again and customize them however you'd like. There are literally thousands of possible layouts that can be used with published adventures or your own. The ability to use all the sheets to form a massive single mega-dungeon - 10 sheeets tall by 10 sheets wide - nearly 65 square feet of playing surface.